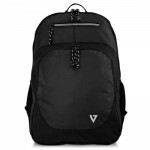 The V7 Vantage Laptop Backpack is a lightweight, multifunctional solution for busy professionals or students. The backpack is designed with a multi-layered foam compartment and Velcro secure band for laptops up to 16.1", with ample storage room in the main zippered compartment for files, notepads, books and power adapters. Additionally, there is a quick access pocket for pens, keys, business cards and smartphones. A smaller inside zippered compartment is perfect for ear-buds, stylus or flash drives. The two elastic mesh side pockets tightly secure water bottles or a travel umbrella. The back padding and contoured adjustable shoulder straps are lined with Air-flow moisture control mesh to help keep a dry and cool back. - Dedicated multi-layered foam compartment and Velcro secure band for laptops up to 16.1"